It has been a very busy year, and I have been woefully neglectful of my website, so in an effort to catch up, this post will take the form of a newsletter. 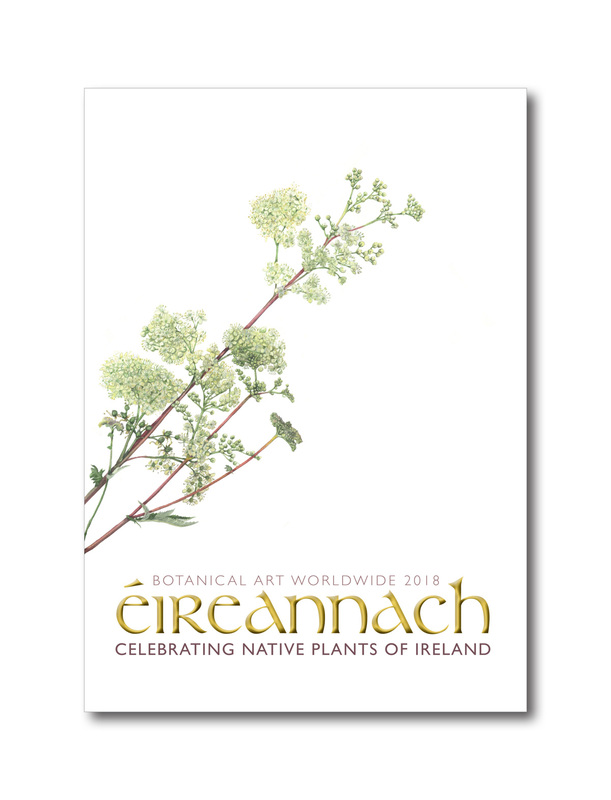 Éireannach: Native Plants of Ireland is the latest project of the Irish Society of Botanical Artists (ISBA) and was part of exciting Botanical Art Worldwide project initiated by the American Society of Botanical Artists. 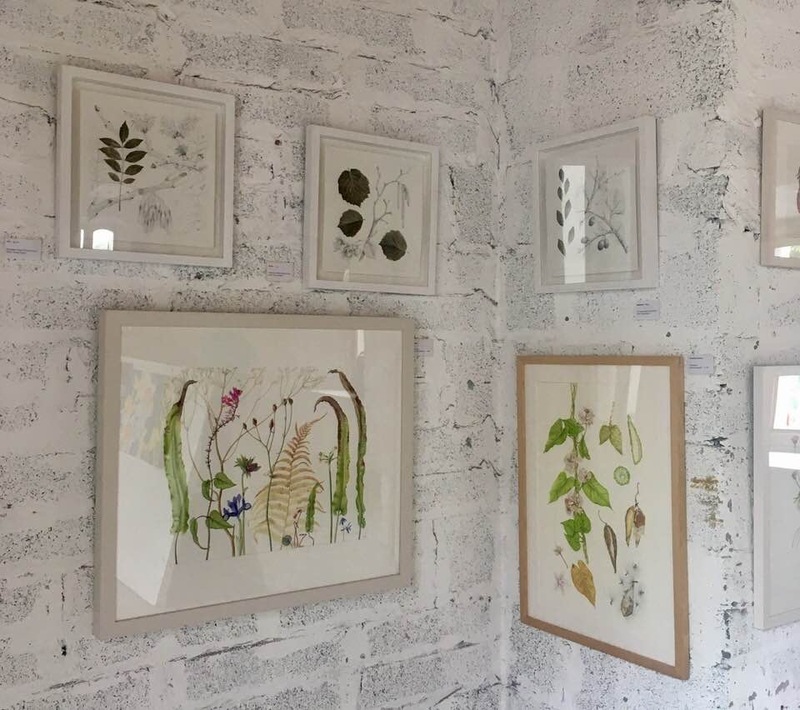 Irish artists painted native Irish wild plants and exhibited the paintings at the National Botanic Gardens in Dublin last May. A high quality book containing all the paintings was launched at the opening of the exhibition. While all of the paintings were featured in the book, it was much more than a catalogue. Each artist wrote a short piece about their plant(s) and a number of Irish conservation groups wrote articles and supplied photographs. Sharon Greene of Wild Irish Foragers contributed a lovely article about traditional uses of some Irish wild plants. In addition, each of the 25 participating countries supplied a representative painting from their own submissions to Botanical Art Worldwide, along with information about their native flora and how it is being portrayed by botanical artists. The book and the exhibition were very well-received, and sales of books and paintings were brisk. You can still order the book (a great Christmas gift !) at www.irishbotanicalartists.ie/shop. For more information about the ground-breaking Worldwide project, see www.botanicalartworldwide.info – well worth a look at some of the wonderful artwork and stories relating the project. 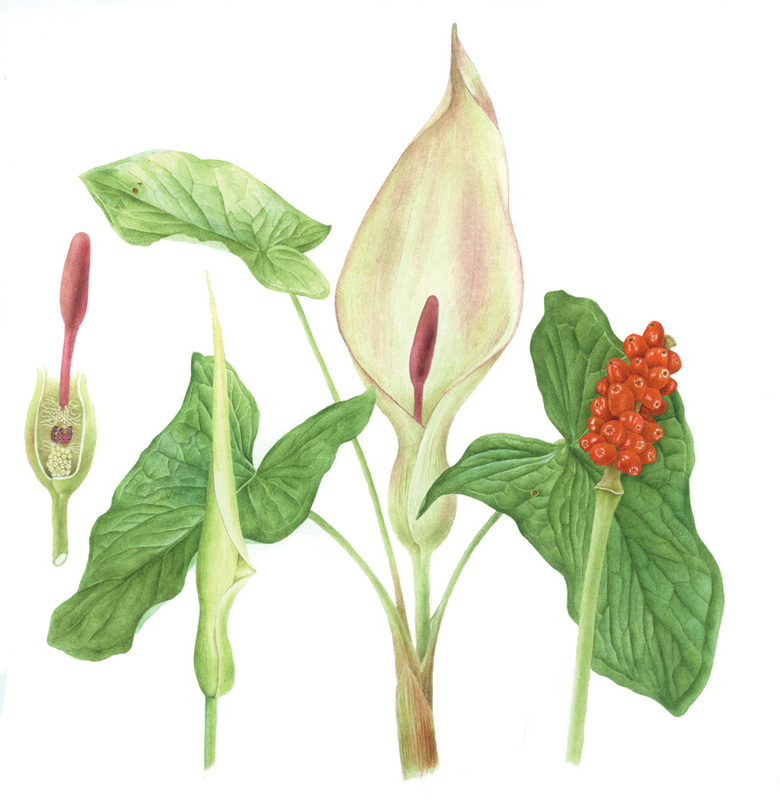 My own contributions to the project were paintings of Arum maculatum (lords and ladies), and Eriophorum angustifolium (bog cotton). Please scroll down the page for a picture of the bog cotton painting. Also included in the exhibition were paintings from two of my students, Anne Burns and Hataitip (Tim) Walsh) who were exhibiting for the first time as botanical artists. As the Éireannach exhibition closed, the annual Botanical and Floral Art in Bloom exhibition was beginning at the Phoenix Park in Dublin, in association with Bloom in the Park. 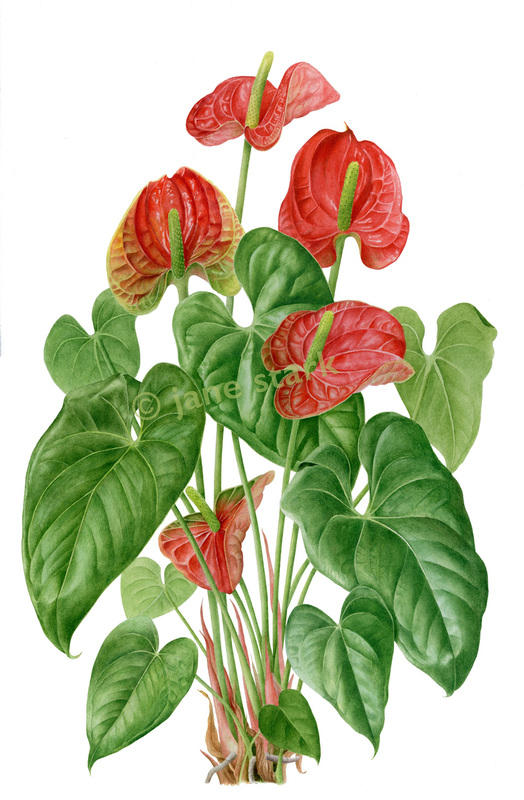 For this exhibition I submitted a watercolour of an Anthurium hybrid, and was delighted that it was awarded a silver medal. The annual Claregalway Castle Botanical Art Expo was held in July in conjunction with the very popular Galway Garden Festival. This is the largest botanical art exhibition in the west of Ireland, and many visitors to the Garden Festival find their way in to the gallery. A number of the ur pop-up shop in the gallery featured Éireannach paintings were on view, along with a selection other works by Irish botanical artists. The pop-up shop, which offered botanical cards, prints, and other products, was very popular and sales were brisk. Autumn brought a lovely surprise when my painting of Sarracenia leucophylla found a very good home with a collector in the United States. Three of my limited edition prints also accompanied the painting. It is a huge pleasure to know that the painting has gone to someone who shares my own passion for carnivorous plants! Although 2018 is drawing to a close, there are still classes and a workshop to look forward to, and next year is shaping up to be another busy year. My next post will give more details on my classes, workshops and a couple of special events coming up in 2019. Thank you to those who follow my blogposts, and for your great patience with the long periods in between them. I will try next year to make them more frequent! The Burren in County Clare on the west coast of Ireland is a breathtakingly beautiful place in any season, but never more so than in May – the time of year when so many of the rare plants that make this landscape so special are in bloom. 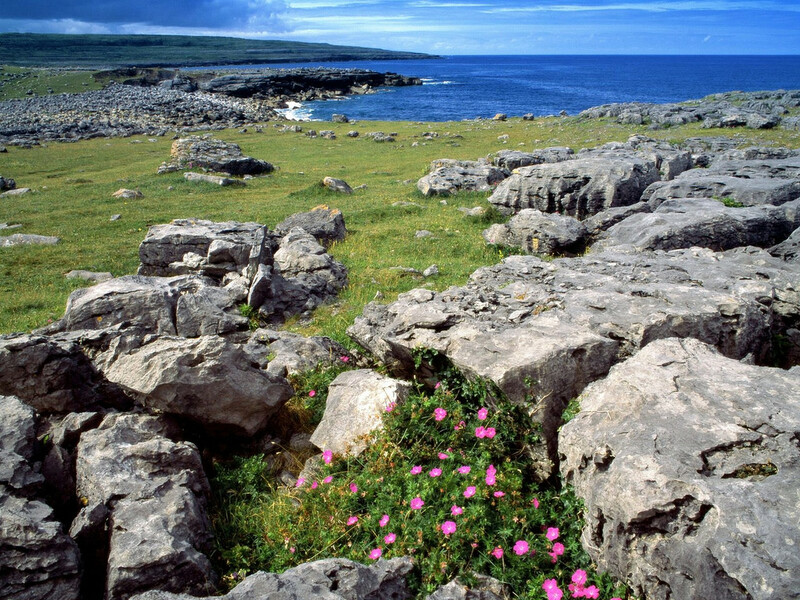 The starkness of the limestone pavement comes alive with the colours of orchids, gentians, burnet rose, mountain avens, bloody cranesbill and many more. The Burren College of Art is located in the heart of the Burren, just outside Ballyvaughan. Superb studio space, combined with a friendly, encouraging atmosphere, superb homemade food in the café, a well-stocked library, and a wide variety of accommodation – not to mention the stunning surroundings – make this a perfect spot for an intensive five day course in botanical art, without the interruptions of home and business. If you have never been to the Burren in springtime, this is an ideal opportunity to immerse yourself in a very special experience. For more details, visit: https://www.burrencollege.ie/programmes/summer-workshops/summer-workshops/ or ring Julia Long at +353 65 707 7200 (email: julia@burrencollege.ie) to sign up for this year’s course which runs from 14th–18th May. I am delighted to be returning to the Burren College of Art in May to teach a workshop in botanical art. 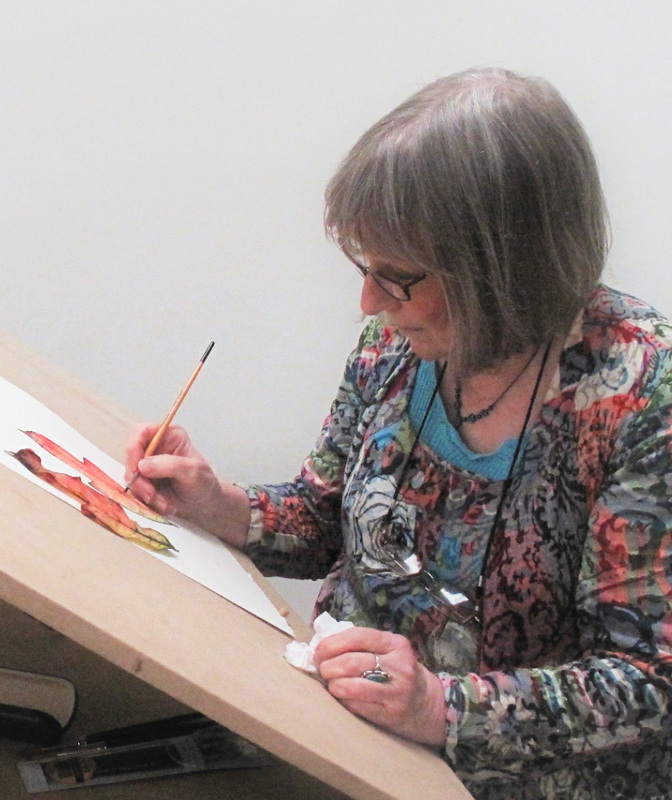 This five-day workshop is designed for those who have some experience in the basics of botanical art and flower painting and would like to further develop their skills through an intensive five days of drawing and painting. Emphasis is on individual tuition and allowing students to work at their own pace and level of experience. There are many places in Ireland that can simply take your breath away. Others inspire you. Some make you feel energized, creative and refreshed, while others bring out all that is best in you. For many people though, only the Burren can sum up all that. The college is located very close to the village of Ballyvaughan. The summer is over and once again the woods and hedgerows are filled with nature’s colourful harvest. Berries seem particularly abundant this year – as I look out my kitchen window, I can see a holly tree some distance away laden down with large clusters of red berries. While the garden has lost its summer colours, this morning I managed to gather an armful of material for tomorrow’s class that included crabapples, some still flowering foxgloves, Michaelmas daisies and numerous types of leaves. Autumn classes are now in full swing on Thursday mornings in Moycullen at our lovely new venue in Áras Uilinn. At last, we have room for more students, and a wonderful, bright room in which to work. Although we are three weeks into the present 8-week course, if anyone would like to join us, a pro rata fee can be arranged. Each student receives individual tutoring at their own level, and beginners are very welcome. A new term begins on Thursday 16 November and bookings are now being taken. A full schedule of classes up to May 2018 is now available. Please email me at laragan.hall@gmail.com for further details or to book a place. In addition to the weekly classes in Moycullen, I also have two day-long workshops at Claregalway Castle on Saturday 14 and Saturday 21 October. Workshops are from 10am until 4pm, and the cost for a single workshop is €65, including lunch. Book and pay in advance for the two workshops and you save €10 (€120 for the two workshops, including lunch). There will be more workshops at the castle during the winter months – dates to be announced shortly. Christmas Fairs may seem a long way off right now, but bookings begin early. This year, I am delighted that my botanical cards and prints have been accepted for the annual pre-Christmas Spiddal Gift Shop in the heart of Spiddal village in Co. Galway. The pop-up shop opens 23 November and closes 24 December. It is open seven days a week, 9-7 Monday to Saturday, 12-6 on Sunday. The shop features high quality local arts and crafts and is a really excellent spot for Christmas shopping. I shall also have a stand at the NUIG Craft Fair on Wednesday 29 November, where proceeds are donated to animal charities in the Galway area, and of course, I shall be at the very festive Claregalway Castle Christmas Fair as usual in early December (date tba). My cards and mounted prints are carried in Moycullen Book Shop, and my cards are also for sale at the National Botanic Gardens Visitor Centre in Glasnevin. You can also order directly from me at laragan.hall@gmail.com. Limited edition archival pigment ink prints are also available. 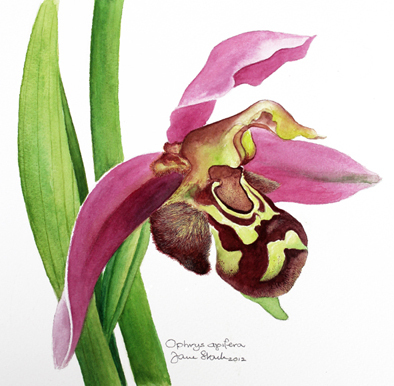 This watercolour on Fabriano Artistic 640gsm was painted for Heritage Irish Plants – Plandaí Oidhreachta, a joint project between the Irish Garden Plant Society (IGPS) and the Irish Society of Botanical Artists (ISBA). 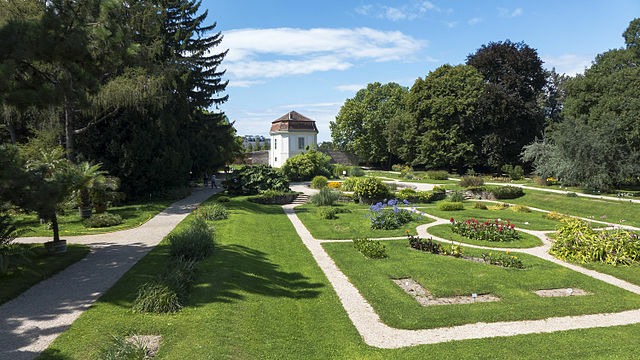 Fifty-nine botanical artists painted Irish heritage garden plants in eight categories: snowdrops, iris, sweet peas, dahlias, plants bred from native Irish species, daffodils, primroses and woody plants. Members of the IGPS and other Irish plantsmen wrote the text to accompany this selection of cultivars, most of which have been bred since 2000. Iris ‘Killiney’, along with two other bearded iris (‘War and Peace’ and ‘High Command’) were exceptions, having been bred and named by Bertram Long: ‘Kilkenny’ was first exhibited in 1939, whilst ‘War and Peace’ and ‘High Command’ were introduced in 1943 and 1945 respectively. All the paintings featuring in the book were exhibited at the National Botanic Gardens in Glasnevin, Dublin, in November 2016. The exhibition was opened by Martyn Rix, editor of Curtis’s Botanical Magazine. The original painting of Iris ‘Killiney’ has been sold to a private collector, but a limited edition of 20 full-size, mounted, archival pigment prints are available for sale at €120 each, plus postage and packing. For further details, please email me at janestarkbotanicals@gmail.com. Anyone who has visited the west of Ireland in the summer has almost certainly seen large drifts of this beautiful, delicate member of the sedge family covering tracts of bogland, the fluffy white seed heads standing out against the surrounding earthy tones. ‘Bog cotton’ or ‘cottongrass’ is native to Ireland, but is found throughout the Northern hemisphere in areas of peatland and heath, as far north as Alaska and Greenland. After painting the magnificent and stately Iris ‘Killiney’, I decided to paint something much less showy and decided on this modest little plant. It seemed in keeping with receiving the news that my parents, after nearly 75 years of marriage, were both experiencing the effects of their impressive ages (95 and 97) and had to give up their independence to be cared for in a nursing home. As I painted the bog cotton, my Dad’s condition deteriorated following a bout of pneumonia. On Friday, 23rd June, around 1.30pm Irish time, I put the finishing touches to the painting. Shortly afterwards, I learned that he had passed away very peacefully in Canada at about the same time. I decided to keep the painting in my own collection as a special reminder and tribute to my Dad, who had encouraged me to develop my gifts as an artist from the time I was a little girl. A limited edition of 20 full-size, mounted, archival pigment prints are available for sale at €95 each, plus postage and packing. Carnivorous plants hold a huge fascination for me after painting the South American sun pitcher Heliamphora heterodoxa a couple years ago. Sarracenia leucophylla is a native North American pitcher plant belonging to the same family Sarraceniaceae. It’s a fairly large painting, as I was working at the actual plant size. I was under time pressure to finish the painting in time for the Botanical and Floral Art in Bloom exhibition at Phoenix Park at the beginning of June 2017, and found the number of pitchers I had decided to paint quite challenging, particularly since I had to work with the painting upside down when I was doing the flowers and tops of the pitchers. Fortunately, I managed to finish it in time for the exhibition and was delighted when it was a awarded a bronze medal. The original mounted and framed painting is for sale for €1250. These cards are A5 size – 150 x 210mm, blank inside, printed on a matt finish 350gsm card, suitable for writing on. Cards are in a sealed cellophane wrapper with envelope.